He also had a friend called Snowy the Donut Horse, who could cry out donuts. When Snowy or Mr. Donut Pants were sad, they could catch their tear donuts in their mouths and this cheered them up. One day they got in their donut car and flew to Donut York. 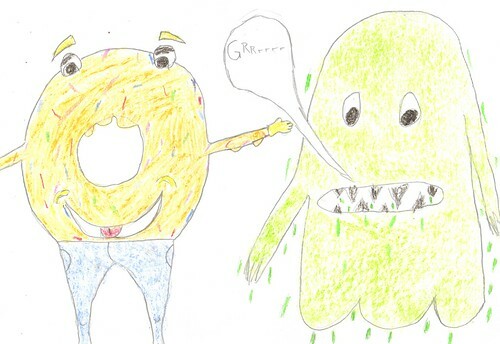 “Watch out for Johnny the Slobbery Monster while we’re in Donut York” said Mr. Donut Pants. “Yeah, I’ll watch out for him and then we can see the Statue of Donuts.” said Snowy.